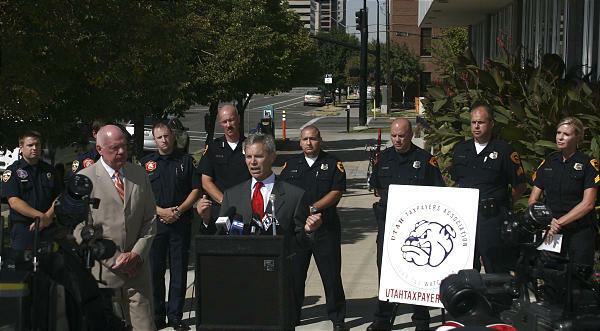 In a press conference held Wednesday at 11:00 a.m., Senator Howard Stephenson, President of the Utah Taxpayers Association, and Mayor Ralph Becker announced that the Utah Taxpayers Association will support Salt Lake City’s Proposition 1: Public Safety Facilities Bond. “People have said that hell would freeze over before the Utah Taxpayers Association supported a Salt Lake City property tax bond. I am here to announce that hell has frozen over and we are encouraging voters to approve the $125 million Salt Lake City bond, Prop 1,” explained Stephenson. Stephenson also said that he will encourage the legislature to prioritize funding to combine the State Emergency Operations Center and Salt Lake City’s EOC. The State of Utah also needs a new upgraded Emergency Operations Center and are looking into partnering with Salt Lake City to combine resources and create cost savings by working together. 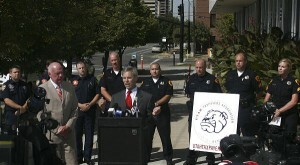 On November 3, 2009, registered voters in Salt Lake City will have the opportunity to vote on Prop 1. Proposition 1 is a proposed $125 million general obligation bond which is expected to raise taxes on an average home by $75 per year.